You are invited to a seminar on Lighting Design. This seminar identifies the lighting tools required to illuminate prestigious residential spaces. Lighting techniques such as accent lighting, wall-washing, wall-grazing, cove lighting and general ambient lighting will be discussed along with information regarding today’s most popular light sources (lamps) and their color, intensity and energy consumption attributes. Project photos demonstrating the various lighting tools will bring these techniques to life. Relevant energy and construction code issues will be considered as well. 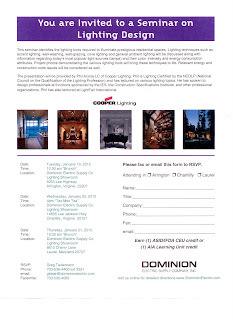 I'd also like to thank Cooper Lighting for sponsoring this seminar and putting it all together for us. It should be a great event!